After Congress enacted the 1985 Gold Bullion Act, the American Eagle Gold Bullion Coins were released in 1986 by the U.S. Mint. It comes in four sizes 1 oz, ½ oz, ¼ oz, and 1/10 oz which have denominations $50, $25, $10, and $5 respectively. 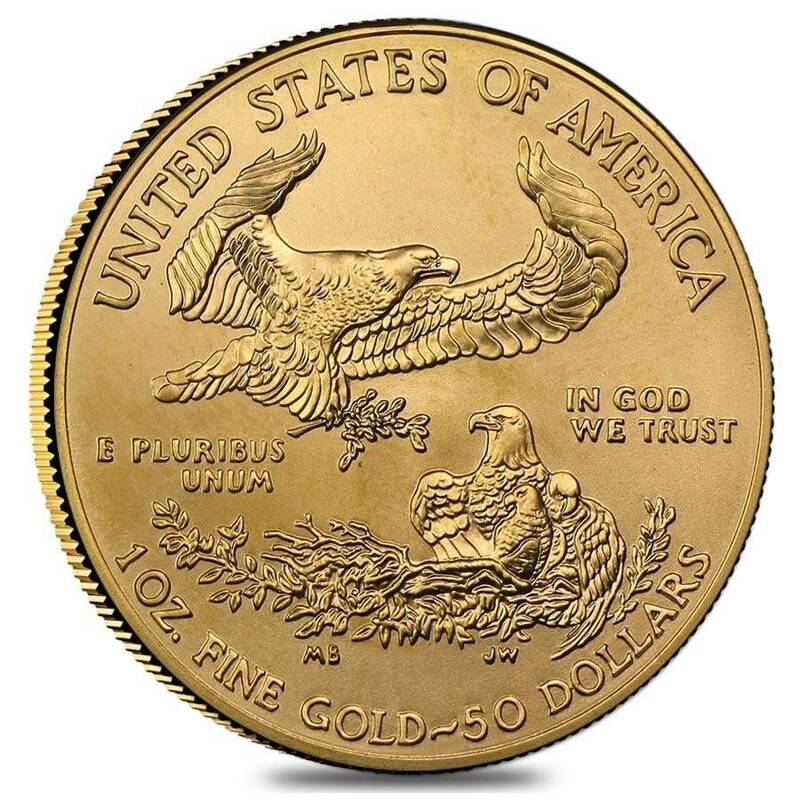 Eagles are the only modern gold bullions authorized by the U.S. Government. Per law, they are made from the gold that comes only from American mines. The U.S. Mint guarantees its content, weight, and purity. The obverse depicts the image of the graceful Lady Liberty in full length, originally created and used for the $20 Gold Double Eagles from 1907. With her beautiful hair flowing against the wind while striding forward, she is the symbol of peace, victory, and enlightenment. On the reverse side of this beautiful coin is the stunning image of a family of bald eagles, designed by the talented Miley Busiek. Being the only official gold bullion coin in the US, this astounding coin is a timeless addition and a treasured keepsake any collector or investor. Made from 91.67% pure gold, with a weight of 1 oz. Produced by the well-known US Mint. Individual coins come in plastic flips. Lots of 20 come in mint-issued tubes. Bears a $50 USD denomination. Approved to be included in IRAs. Legal tender coin in the US with purity and weight backed by the US Government. Obverse: Lady Liberty with a torch in right hand and an olive branch in left hand striding forward with her hair flowing on a background of a rising sun and the Capitol building. Reverse: A male gold eagle holding an olive branch is flying above the nest which contains a female gold eagle and her hatchlings, a design by Miley Busiek. Bullion Exchanges offers you a splendid collection of wonderful bullion coins. Add this spectacular coin to your portfolio today, and it will be thoroughly packaged and shipped to your address. For any questions, just contact us at 800.852.6884, or email us, and we will be happy to assist you. Bullion Exchanges offers such better prices than companies like JM Bullion. I felt that I was practically stealing this 1995 $50 Gold American Eagle Coin which came in just a few days from my order in perfect condition. I have been very happy with every order and Bullion Exchanges has earned my business and trust. Excellent. Very happy with the coin. The service is phenomenal and the shipping was super fast. I'm gonna be a Bullionaire for life. Quick delivery. A spectacular coin. Bullion Exchanges is a great company, I will continue to purchase gold from them! 100% satisfied with this purchase and every other one I've made. There customer service representatives are always available and helpful with any questions or concerns I have. The extra time and care you receive from Bullion Exchanges compares to no other.Thank you!!!!!!!! I received a nice looking Gold Eagle coin and some gold bars at a good price. All were packed well and delivered on time. When I'm in doubt what to buy, I always go for one more American Eagle. 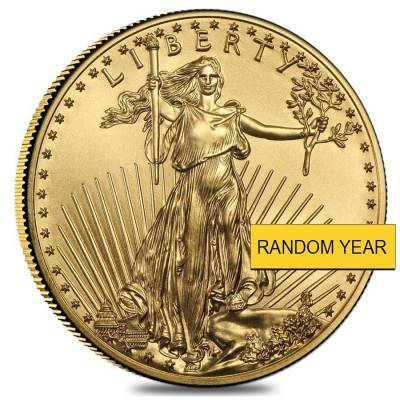 I'd say as an investor with 15 experience: Gold American Eagle is always a good idea. This is my first gold eagle and I am extremely happy with the coin. Bullion Exchanges service is great. 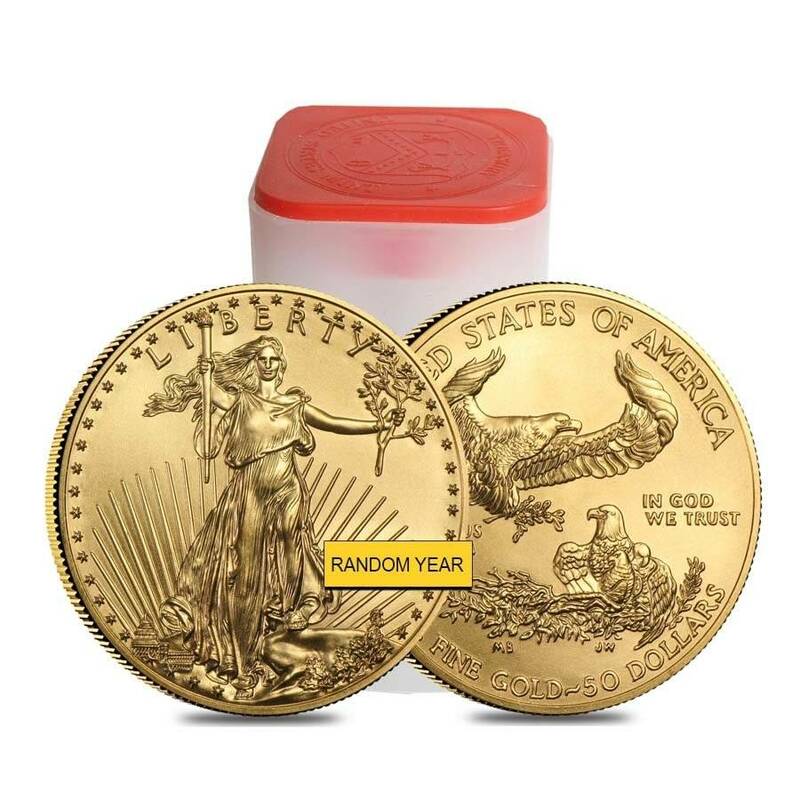 By far the lowest price on the internet for 1 oz gold eagles. Thanks for the great product and amazing prices. Will be sure to come back again for my best bullion purchase. Just received my 1 oz gold eagle today and it is beautiful. Thank you for the great packaging and expedited shipping. Got my first gold american eagle from Bullion Exchanges and I'm very happy! Came in just two days, carefully packed and looking great. Many thanks! I've been a PM buyer for a short period of time but long enough to see how different every companies shipping process works. By far, Bullion Exchanges has lived up to its word with its three day shipping and confirmation calls to avoid fraud. I have recommended their company to many of my friends and family and will continue do so! Bullion Exchanges got my coin to me in just three days and with excellent packaging. I'll definitely buy from BE again! With this purchase, you earn 1308 Bullionaire Bucks 1308 BB = $1.31. We currently have 968 of this item in stock. For every $1 spend, you will earn 1 Bullionaire Buck which is equivalent to $0.001 off a future purchase. 1308 BB = $1.31. These indications are for purchases of $10,000 or more. Purchase prices will be less for smaller transactions.